A Tale of the Grenada Raiders, Amazon Digital Services LLC, 2017. Available now as an eBook on the Kindle Store, in softcover from Amazon, on Apple iBooks, GooglePlay, and on GoogleBooks. Coming soon as an AudioBook. In commemoration of our blessed dead 34 years ago in Operation Urgent Fury, I publish my war memoir, A Tale of the Grenada Raiders. Twenty six years in the making, I wrote the first stanzas of this highly personal chronicle of Rangers at war in 1991, after I resigned from DEA. The manuscript evolved over the decades. I long called it Learning the Language of Nightmares. Then I called it Idioms of Dreams. 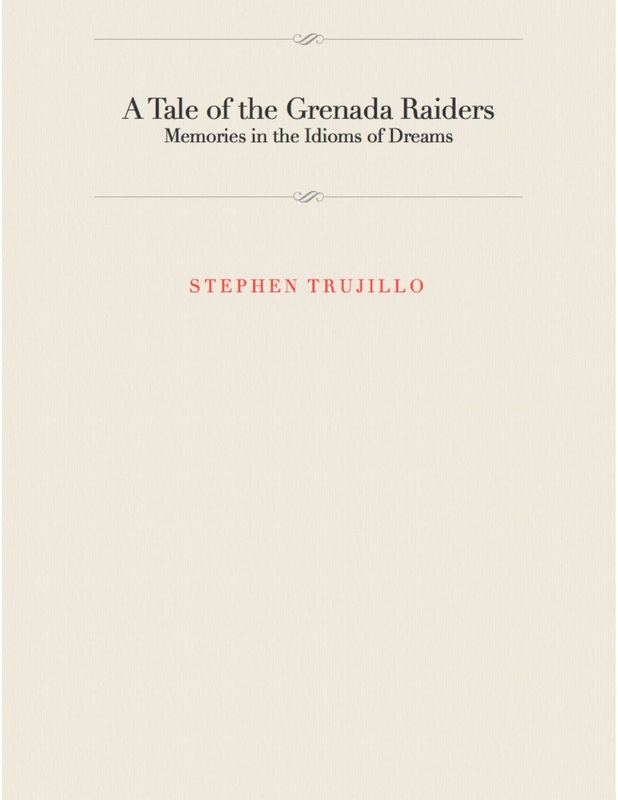 As I went to print, I decided to title it A Tale of the Grenada Raiders: Memories in the Idioms of Dreams, because that is what it is. 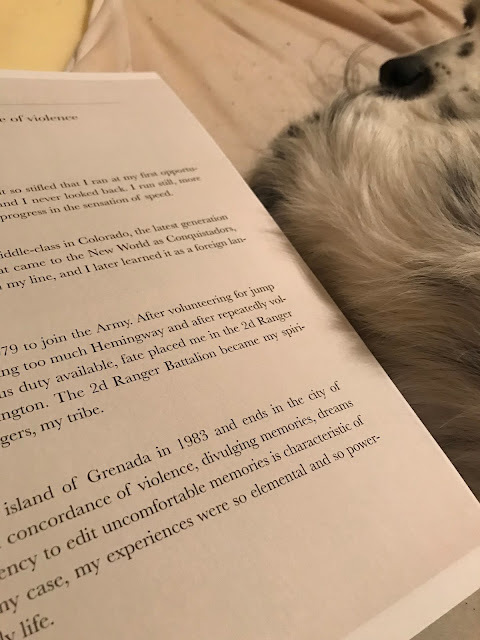 This memoir is difficult to classify, but at its foundation, it is an eyewitness history of Rangers during the invasion of revolutionary Grenada in 1983. Brian Donovan sent me this snapshot of Chapter 2, which you can read free on GooglePlay. I returned to the manuscript over the years, lacquering on meaning, until health challenges two years ago scared me. That lit a fire under me, and I finalized the manuscript feeling the hot breath of the Reaper on my neck. I have long lived on borrowed time. I should have died many times over the years, and I recount several of those moments in this very strange book about war. I do not believe that luck is the reason that I am still alive to write these words. Few of us can foretell the future, but I know that the Big Ranger in the Sky has a plan for me, and my purpose in this incarnation is not yet complete. Publishing this book is part of His plan, and I did not want to die without publishing this manuscript. Now it is done. It is a milestone for me. And the Reaper is that much closer on my trail. He will catch me soon enough. A Tale of the Grenada Raiders recounts what it was like to go to combat for the first time as a young Ranger, and I make some of the Rangers from my unit famous. They needed to be immortalized. For me, combat was very much an initiation, and a critical factor in the evolution of my personal mysticism. I served with giants, some of the Rangers that I served with played critical roles in American special operations in later years. Some of those Rangers are still serving, one of them at the pinnacle of the Special Operations Command. Tim Latsko sent me this snapshot of page 123, available free on GooglePlay. 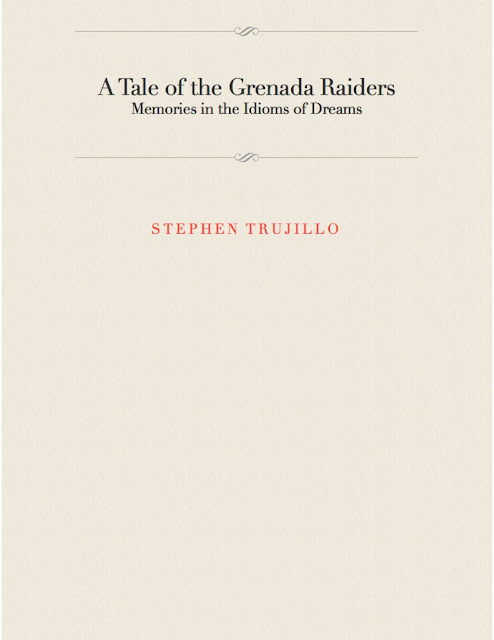 Lushly illustrated, you could almost call A Tale of the Grenada Raiders a picture book. Rangers love photographs, mostly because we were not supposed to take photographs, so these photos were also individual acts of rebellion. As every person named in the narrative had an opportunity to review the manuscript before publication, the consequence was a deluge of corrections and additional information. My Ranger brothers caught many errors. I use the real names of the protagonists, and I include photographs of them all. The events transpired precisely as I recount them, with a couple of exceptions that I address in captions to photos and later, in the forthcoming anthology Tales of the Rangers. As the narrative grew, I had to split off bridge chapters connecting Ranger stories to Snowcap stories into a separate book, so the companion memoir The Rosetta Stone of Memories will be published in 2018. The Rosetta Stone of Memories is mostly complete. I need to polish it, to shellac its deeper layers of meaning, and I need to curate photos and documents that I collected as the years went by. Many of the stories that Rangers told on our secret Facebook pages, on SOCNET, and on ArmyRanger.com over the years, are now captured for eternity in Tales of the Rangers, the third volume in the trilogy, which is forecasted for publication in 2019. Tales of the Rangers is the book that the Ranger community actually wants. It is an anthology of Ranger oral histories that Rangers recounted over campfires deep in the North American rainforests of the Olympic peninsula since the early 1980's. Tales of the Rangers is now up to 777 pages, and I estimate that it is 75% complete. It will exceed 1,000 pages when I finalize it. I may end up publishing it in two volumes. Many Rangers contributed testimonies. Tales of the Rangers is their book, written by them. I am just the messenger. I hope that you like A Tale of the Grenada Raiders. It is an idiosyncratic memoir, so some may find it controversial. I am sure that it will have critics, and some Rangers did disagree with some of my recollections during the review period. I address Ranger controversies in the Forward and the Afterward, and in detail in Tales of the Rangers. A Tale of the Grenada Raiders is an unprecedented glimpse into warfare at the grunt level, so readers fascinated by militaria will enjoy it. But it is unlike any other personal account of war that I ever read, and I read many of them. I had no option but to write this memoir in my own way. I do hope that those of you who read it will review it, anonymously or not, on its Amazon sales pages, or on GoogleBooks or GooglePlay. If you hate it, you can say so. If you like it, I will be grateful. So far the book has garnered fifty 5-star reviews. Yes, 50 reviews. All from verified purchasers on Amazon, all 5-stars. Some of those reviews are very insightful. Thank you, friends. In the end, all that a writer truly wants is to be read. Many writers are never read, their words consigned to oblivion. Others are only discovered posthumously. So be it. Pete Russell sent me this photo of the softcover ordered from Amazon. A Tale of the Grenada Raiders is available in both Kindle eBook and softcover through Amazon. The softcover is published in 8.5x11 inches large format, full color. At 377 pages, the physical softcover weighs 2.4lbs. It is a big book. I finally succeeded in getting the book listed on GoogleBooks and on GooglePlay. You can read much of the work for free on GoogleBooks. The GooglePlay eBook edition is listed by Google at $9.99. The price that Amazon charges for the softcover fluctuated for a few days after its release. The softcover was initially listed at $64.99, then Amazon priced it without warning to me at $21.99. After 90 days at a discounted price, Amazon reset the softcover price back to its list price of $64.99. That is the price for the softcover at this time. Those of you who must hold a physical book in your hands are now charged an extortionate price by Amazon. I set the eBook price at $14.99 on GooglePlay as well, then Google decided to offer it for $9.99. Jeff Mellinger sent me this photo of pages 183 and 184, available for free on GooglePlay. I apologize for this pricing confusion, but it is out of my hands. Amazon rationalizes its softcover pricing by citing the large format of the book at 8.5-inches x 11 inches, and the number of photographs in the book. As I say, at 377 pages, the book weighs 2.4 pounds. The book is also available on iBooks. The iBooks version is $14.99, and it is electronic only, for reading on Apple iDevices like iPads, iPhones and Macs. It is very slick, befitting an Apple product. The GooglePlay eBook edition came online on December 15, and Google priced it at $9.99. GoogleBooks offers a large portion of the book for free, you can read much of the manuscript at no charge, and then purchase the remainder through GooglePlay. For those of you who must hold a physical book in your hands, the Amazon softcover is the only option at this time. I prefer that readers read this book in electronic format. It is not only much cheaper, an electronic format enables you to zoom in on the photos and to search the narrative. Nonetheless, some readers prefer a physical book. As I get caught up, I will also release A Tale of the Grenada Raiders in audio format, as an AudioBook. I will read every word aloud myself. For those of you who waited for this book, I thank you for your patience. For those of you who read it, I am grateful for your time, for your consciousness, and for your eyeballs. Young Rangers died in combat on revolutionary Grenada. I hope that this book is a worthy memorial of them. ETA: Greg Chabot published an excerpt of Chapter 13 in Soldier of Fortune Magazine, and George Hand reviewed the work for SOFREP. As SOFREP is a subscription service, I posted the entirety of the review on my Facebook page. Ranger Karl Monger interviewed me for The New American Veteran and posted it on YouTube and Facebook. ETA: I edited some facts that changed over time on 15 February 2018. Google does not compete with Amazon in the print-on-demand marketplace. Amazon holds a virtual monopoly there, and the only way to purchase a physical version of this book is through Amazon. At the time of this update, the price remains $64.99. I am very sorry about this, but Amazon is in a position to do whatever they like, and they do. The cheapest way to access an electronic copy of this book is via GoogleBooks or GooglePlay, at $9.99. Looking forward to reading your book. The only issue I have, "You did not mention me or my name." Just kidding, really looking forward to reading it and will give you 'True' feedback. All the best to you and your family. Feel free to contact me any time. You have a place to stay if you ever visit Colorado. Good work Ranger Brother. I ordered and read your book. I got the big one screw that electronic stuff. Great read, great job and a testament to your beloved Rangers. Hold hard doc and keep punching. Thank you for reading the book. Hello Captain Trujillo. I hope I got your rank correct. I read your book and thoroughly enjoyed it. Your fluid and descriptive writing style is first rate. I am anxiously awaiting the Rosetta Stone of Memories book. Could you tell me when I may expect it's release? Also, I am curious as to how many 2nd Battalion Rangers from the rank of E-4 and below participated in Urgent Fury since only approximately half of the battalion could deploy. For example, most grenadiers and automatic riflemen are E4s. Did they deploy or where more experienced sergeants assigned those roles? Thank you again for an amazing read. Your are a gifted and talented writer. Thank you, Mike. I appreciate your compliments! I am polishing The Rosetta Stone of Memories now, I work on it every day. I am not sure when I will consider it done, there are many photos and documents that I want to access in order to include them ... I know that they exist, so I now need to figure out how to put my mitts on them. I will definitely release it no later than the 35th anniversary of Urgent Fury, the 25th of October. I will try hard to finish it sooner. The thing is, the multiverses keep leading me to things that need to be integrated. I understand that this sounds strange, but I am very much writing this work in collaboration with *something* that is expressing things that it wants to be included. Some would say that this is my subconscious, but I am too old to dismiss it so readily. And the coincidences are too frequent and too sophisticated to merely be coincidence. Some would call this the Muse. I leave it unnamed. There is much synchronicity happening as I write. I will say this: the Preface to the work is unquestionably the weirdest preface that any writer in history ever wrote. I am serious. Anyway. There were very few E4's or lower that jumped in. A few SP4's, but as I recall, only one PFC from Company A, and that was the RTO for the Company Commander. He was an un-tabbed PFC, the youngest Ranger of us all. The 2d Bat Rangers that jumped in were all E4 or higher. Most of us were buck sergeants. I believe that the jump manifests from both Battalions are on the web, they are certainly on Facebook, accessible on various Ranger pages. That would enable you to get a hard count, as all Rangers were listed by name and rank. One other thing that may help explain: we were task organized by gun jeeps, we initially planned to airland the majority of our force and to drive to strongpoints in gun jeeps. We were not really maintaining unit integrity, sending intact rifle squads. The younger Rangers were mostly consigned to the mythical "second wave" that never happened, and a very few ranking sergeants were left with them. In A Co, for example, we left First Sergeant Palacios back, with Sean Bray from 1st platoon. Those two stowed away on a resupply bird at Hunter to get onto the island, and they landed just in time to go on the Calivigny raid. I hope that that helps explain what happened. Thank you very much for reading the book, and thank you for liking it! Thank you for your prompt response. I appreciate you taking the time out of your busy schedule to reply. I just wanted to add that I am very much interested in Urgent Fury because that was the lynch pin operation that gave Americans their pride back. I was 19 at the time and vividly recall how proud I was of all of you. Thank you for your service! I will never forget how I felt when evacuated students dropped to their knees and kissed American soil as the news cameras rolled. I asked Gunny Mooch to pull the numbers on how many Rangers were E4 or below. He remembered the RTO’s name. That was Al Bishop, then PFC Bishop. Gunny Mooch knows everything. You cannot imagine how many errors that he caught in my manuscripts! So I reread your initial reply to my first post and am more curious than ever about Rosetta Stone. You mention the occurrence of synchronicity. Maybe those things that you think only appear to be related actually are. Not having prior military service, which I deeply regret every day, I have no point of reference for your experiences. But your thoughts and emotions are pivotal to the stories you tell. That sets your work apart from 'Black Hawk Down' or other more clinical story telling. I live a life that could have been vicariously through your experiences. I look forward to details of Basic training, Airborne, RIP, pre-ranger and ranger school. And I would love to hear about SFQC and the MFF course, details of where you traveled to for various training and exercises, etc. Regardless of the content of the book, I know it will be a great read. If you receive an attachment for the jump manifest, or just want to send me an email instead of corresponding through your blog, you can email me at [email protected] Thanks. You are going to love Rosetta Stone. It is right up your alley! 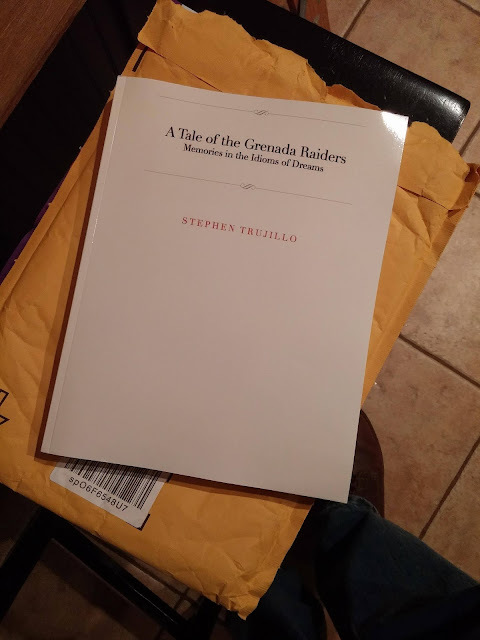 One criticism that I received of Tales of the Grenada Raiders was that I included very little about how I ended up there. An editor called them “continuity errors.” I deliberately omitted those chapters, as I wanted that manuscript to be tight and terse and focused. So I put them in Rosetta Stone. One challenge has been to balance detail and to keep its chapters short and defined. But I explain precisely where I came from, and how I ended up living the great adventure of my life. Thanks for the email! When I get the MS refined to a point where test readers are mandated, I will include you. Test readers help me with pacing. When too much detail takes a test reader out of the flow, or it interrupts the suspension of disbelief, that is when I know that I need to polish that section harder. I did that with my first book, and test readers gave very useful feedback. You may prefer not to do that, as it may dilute the experience of reading the finished work when it is done. We shall see. Here's the totals for E4 and below 2nd Batt jumpers for OUF. These Rangers were all RTOs, machine gunners, AT gunners, medics, mortarmen, and FO's. Most were tabbed. They had special skills and that's why they made the cut over a lot of other more experienced, tabbed Ranger NCOs. Thank you for looking into this for me. I have always wondered how one goes about selecting half a rifle company. I cannot wait to read Rosetta Stone. Thank you for sharing such deeply personal memories of your service to our nation. Gunny Mooch is the man!